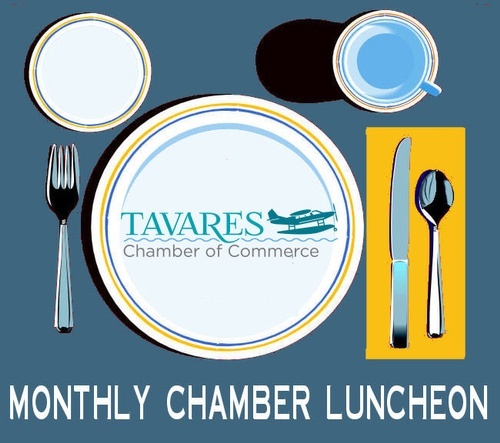 The Tavares Chamber of Commerce monthly Business Luncheon’s objective is to inform and provide leads, tools, resources and referrals by utilizing various guest speakers. This once-a-month Lunch and Learn offers valuable insight and indicators on how to help your business grow. Please join us for our monthly Chamber Business Luncheon, sponsored by Ernie Morris Enterprises, on Wednesday May 22nd, from 11:30am. to 1:00pm., at the Tavares Civic Center, 100 East Caroline Street, Tavares FL 32778. There will be food, raffles, prizes and door prizes. You can register online by selecting the "Register Now" link above, or call (352) 343-2531 and RSVP today, or email Director@TavaresChamber.com. $15.00 per member and $20.00 for non-members. Monthly Business Luncheon. This Lunch and Learn is held the 4th Wednesday of each month. $15.00 for members, $20.00 per non-members.